Anyone who has played Counter Strike understands the value of unique skins. Since the "Arms Deal" update in 2013, countless in-game skins have been developed with many vying for these rare designs—going so far as to create a virtual economy for the game. 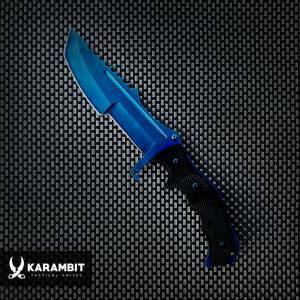 At Karambit Tactical, we allow CSGO fans to live the fandom first hand with their very own Counter Strike knife replicas to match their in-game arsenal. Each of our CSGO knives is custom made to match the design of in-game skins in every detail. From the unique curvature of the karambit knife, to the finish of the skin, and even the weight and grip of the weapon, our knives bring the excitement of tactical mastery to the real world. The Counter Strike Global Offensive "Arms Deal" introduced many new features to the game play, but none, perhaps, as prestigious is the Karambit knife and its rare skins. Inspired by the real life Karambit knife that first originated in Southeast Asia, this weapon features a uniquely curved blade that is said to be inspired by a tiger's claw. This knife also features a small hole on its end, giving users ultimate gripping power, by allowing you to hook your first finger securely in the handle. 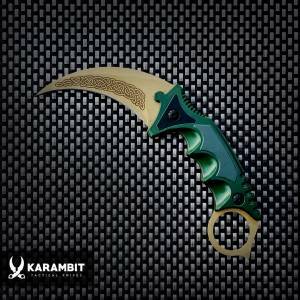 In CSGO, the karambit knife is one of the rarest tactical weapons in the game, and is found only in certain weapon cases. While several cosmetic knives have been added to the game over time with updates, the karambit remains one of the five original tactical weapons added during the Arms Deal. Thanks to its sleek design and rarity, the karambit knife is arguably one of the most sought-after and most expensive weapons in CSGO. In fact, this rare treasure has become one of the icons in the game, making it a prestigious prize both in game and out of it. Outside of the world of CSGO, karambit knives are still considered an elite tactical tool, even inspiring their own branch of martial arts. Due to the razor sharp curvature of the blade, karambit knives are known for their superior cutting power, making them a deadly weapon to reckon with. At Karambit Tactical, our products are created by fans, for fans. Through every step of the manufacturing process, we emphasize craftsmanship in order to ensure that your knife looks exactly like its in-game counterpart. In addition, unlike many of our competitors, our CS GO knives are minted using real metals. This ensures that your knife doesn't only look like it does in the game, but it feels like it would too. Thanks to the superior quality and design of our products, we are proud to be a leading supplier of real CSGO knifes in the nation. We ship our karambit knives to fans worldwide and have received international praise from customers across the globe. Whether you're looking for a real life CSGO knife to put on display in your gaming room, or a blade that you can practice tactical techniques with, our official replica knives will not disappoint. The Look: At Karambit Tactical we are dedicated to preserving the ancient design of the karambit knife, while embellishing it with the elite skin designs we all know and love. Rare skins are an important part of the Counter Strike Global Offensive gameplay, allowing you to customize your weapons to match your unique style. As a leading manufacturer of official CSGO knives, our mission is to create real life skins that look just as good as they do on screen. In order to accomplish this, each of our products is created with craftsman quality attention to detail, carefully selecting the best metals, pigments, and finishes, to replicate elite skins. Our Karambit fade knives, in particular, have been praised for their superior design, which looks identical to their in-game counterparts. As one of the most popular skins in the game, fans across the globe demanded a way to enjoy Karambit fade IRL—and we listened. Our fade knives exhibit brilliant color transitions, and in some cases, custom designs and finishes to pay homage to this Counter Strike icon. In addition to our Karambit fade real life replicas, we also carry a variety of elite knife skins, like the prestigious Fox Maniago FX-636T karambit. This sleek all-black combat knife is sure to strike fear into the heart of any enemy just with its looks. Complete with a sheath and belt clip, this elite knife is the perfect gift for the ultimate CSGO fan. Regardless of the knife you choose, all Karambit products are held to the highest design standards, allowing us to create the best SC GO knives for sale on the market. The Feel: One of the benefits of buying CS GO knives IRL, is getting to admire your favorite weapons in the real world. Which means you don't just need a knife the looks real—you need a knife the feels real too. At Karambit, we sell real knives to real fans so that you can master your favorite tactical tricks in person. Many of our knives have a solid weight to them due to the fact that they are made out of real metals. The weightiness of our products make them great for practicing knife spinning and other professional tricks. In addition to the weight of our products, we also focus on creating a comfortable and efficient design, featuring ergonomic handles, easy grips, and aerodynamic blades for maximum performance and authenticity. For those looking to practice self-defense, our razor sharp blades ensure maximum cutting power, while the curvature and quality of the blade allow for smooth and swift counter-movements with minimal effort. The Price: Last but not least, at Karambit Tactical, we pride ourselves on offering some of the most competitive prices on the market for blades of the same quality and standard. Our official CS GO knives are unmatched in their field, which is why many tactical experts, celebrity cosplayers, and professional gamers choose our brand over competitors. Nevertheless, we strive to keep our pricing as affordable as possible so that all fans can experience the fun of owning real life CSGO knives. Size and Function: Our karambit knives range from standard lengths (about 18cm) for full tactical power, to a shorter length (about 9cm) for easy conceal and carry. Our smaller knives are made of lightweight metal, allowing you to easily carry them as a pocket knife and flip them open quickly whenever needed. Our larger knives, on the other hand, give the user an authentic feel for the karambit knife, with enough weight to them to practice knife spinning and other tactical tricks. At Karambit Tactical, we carry both fixed blade and folding blade styles, and they each feature a hole at the end of the handle for easy grip. If you or someone you know is a major Counter Strike Global Offensive fan, then our real life CS GO knives can be the perfect gift for any occasion. Since the release of the 'Arms Deal' in 2013, the karambit knife has been viewed as one of the most prestigious tactical weapons due to its sheer rarity. In the CSGO virtual economy, these knives have become very expensive, as they continue to be one of the most highly sought after tactical weapons in the game. 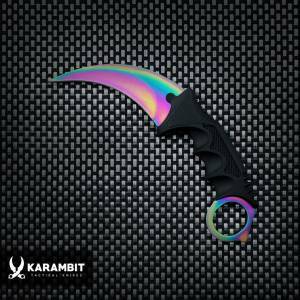 There is no denying the karambit knife is considered an in-game treasure, and with one of our official replicas, this tactical weapon can become a real-life tease too. Featuring brilliantly replicated designs of some of the most popular CSGO knife skins, our products have become a leading choice for Counter Strike fans across the world. From professional gamers, to celebrity cosplayers, tactical experts, and everyday fans, out karambit knives pay homage to the mastery and prestige needed to wield one of these weapons in the game. 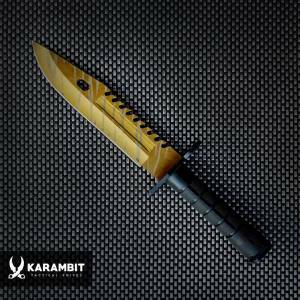 At Karambit Tactical, we aim to transpose the prestige of CSGO knife skins from in-game play to the real world. Our replicas make the perfect gift—doubling as a piece of fan merchandise and a real life weapon owners can use to practice self-defense counter strikes and master tactical tricks. Pairing the ancient art of karambit wielding with the draw of beautifully crafted skins, our karambit knives can transform any gamers into a fearless warrior. At Karambit Tactical, we are proud to offer worldwide shipping to our customers. After processing, most orders will arrive between 5 and 14 business days, though express delivery options are available for rush orders. 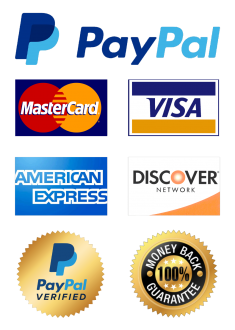 Shipping costs will be determined at checkout depending on your country's exchange rate and any additional shipping fees. Disclaimer: Our karambit knives are not toys and should always be handled with care. Karambit can be described as a remarkable multifunction knife designed to ensure the safety, accuracy, and efficiency of its user. It has a curved or curved blade, an ergonomic handle, and usually has at least one safety ring. The forerunner of the modern carambath first appeared in Indonesia during the 11th century as a tool used in agriculture, respectively. as a sharpening functional blade for universal use. In connection with the expansion of trade in the Indonesian region, the Caribbean quickly spread to the whole of Southeast Asia, especially in two countries - Malaysia and the Philippines. As long as the design of the carabiner may be slightly different due to its geographical origin, it will definitely always have a curved blade and thus will guarantee its owner an extended functionality compared to a straight blade knife. According to tradition, the shape of the carabiner is based on the shape of the tiger joints. In this sense, the razor sharp blade guarantees optimal use for cutting, tearing, cutting, mowing and cutting with maximum efficiency while minimizing effort. Carbide knives are highly prized for their precise cut, cutting-edge blade durability, durability and practical usability for almost any purpose. In the area of self-defense,the curvature of the blade allows for smooth avoidance, with a simple counter-movement, and any desired change in motion is fast, easy and smooth. At the same time, Karambit allows simultaneous reflection of a multi-directional attack and confirms its immediate readiness to cut, cut, mow, hook and reflect the attack. An experienced user can use the karambit to control the movement of the opponent's limbs and accurately track the direction of the opponent's incoming force. Even if the target you want to hit is hidden (such as the kidney or the underworld of your opponent), the curved blade of the carabiner can find its target - because it can "wrap around" the opponent's body and hit it with accurate, a truly devastating effect. Moreover,unlike the use of blades with straight blades in similar situations as we have described in the case of the carabiner, much lower stresses directly affect the wrists of the user. This fact is clearly confirmed by the fact that self-defense made using a carambath is straightforward and effective without affecting the weaker body structure of the user, which reflects the incoming attack. Different types of carriages can have several cutting surfaces and cutting edges designed in a variety of practical combinations to increase overall usefulness and efficiency in relation to specific use for practical and/or combat purposes. Serial, as well as custom-made carriages, are available in both versions - with a fixed and folding blade. Especially popular are CS:GO karambit knives as decorative items. 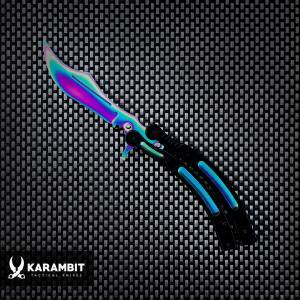 The price of karambit knives starts at only 15 dollars.